Did Jews leaders really want to see Jesus crucified? They did not, according to Gary Greenberg's The Judas Brief. The Gospels charges that Jewish authorities sought to kill Jesus and pressured Pontius Pilate to crucify him have fueled two millennia of virulent anti-Semitism. 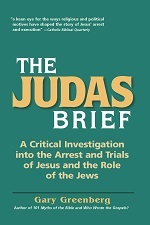 The Judas Brief offers the first full-scale historically based rebuttal to these Gospel accusations. Greenberg concludes that the Jewish authorities did not seek to have Jesus put to death and furthermore acted to save him and his followers and other innocent Jews from a crushing military assault by Roman soldiers. The true villain in all of this, says Greenberg, was Herod Antipas, the Roman ruler of Galilee. Greenberg contends that the Jewish authorities sought to prevent the planned massacre and opened up negotiations with Pilate and Jesus (who was represented by his trusted disciple Judas.) Jesus agreed to remain under house arrest with the High Priest in order to guarantee that his followers caused no disturbances. Pilate agreed that if Jesus’ followers remained quiet, he would allow Jesus to return to Galilee after the holidays ended. But when Herod Antipas learned of this arrangement he demanded that Pilate renege on his promise and execute Jesus or face charges of treason. Pilate yielded to Herod’s threats.